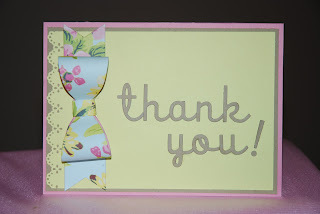 Here's a simple thank you card that uses two of my recent favorite finds. It's die cut from paper and assembled. I won a set of these bows during a blog hop that featured a dear blogger friend, Vicki Chrisman of This Art That Makes Me Happy. Vicki will custom-cut the bows in colors, themes, or papers you designate. The bows come in 3 sizes: small, medium and large. The one on this card is a medium, where the height is about 5". The other neat purchase is an alphabet die set that I recently purchased from Papertrey Ink. 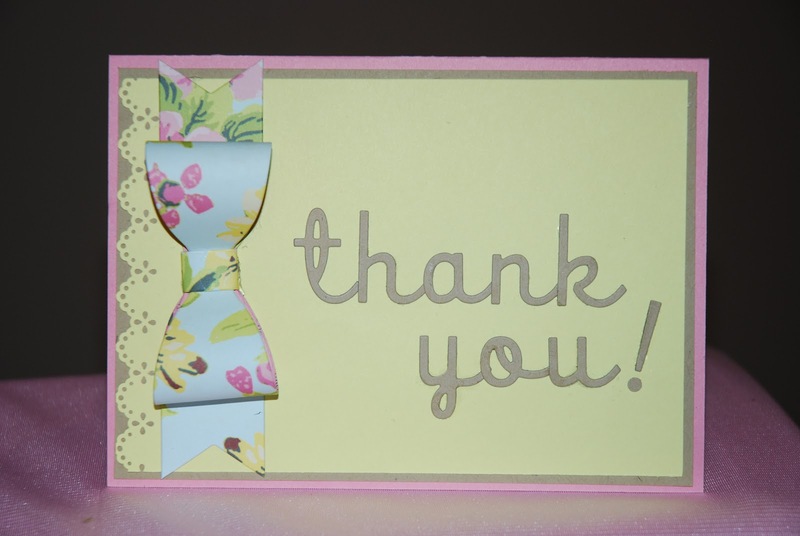 I love the clean script lettering on the "thank you! ", which I cut from kraft card stock. I also VERY much like that the alphabet set comes on a small magnetic sheet so you can keep the letters in order, alphabetized, in storage. They come flat, joined with small bits that you can cut apart to use individually. For now -- and because my sentiment had no duplicate letters -- I cut the full alphabet with one run through the Big Kick, and I saved the unneeded letters in a small baggie for another day. By the way, the paper eyelet lace punch (left side of the card) is one of my oldies-but-goodies from Martha Stewart.